During the summer season when the weather is hot, and you would do anything to cool off, you are prone to making some mistakes operating your air conditioner, which will kill it or cost you a lot in air conditioning repair bills. Although an instruction manual comes with your air conditioner, which outlines the unit’s dos and don’ts, there are still some common mistakes most air conditioner users make that you should be aware of. These mistakes, although common, can cause real problems that can kill your air conditioning unit. This article outlines them and offers tips on how to avoid making them, so your AC unit can continue to work efficiently to keep the summer heat away. A common mistake is the installation of an improperly sized unit, and this can cause various issues. An undersized unit will lack the cooling power to meet your cooling needs, and would have to run non-stop to reach your desired temperature, which will cause it to burn out quickly. While, an oversized unit will not properly dehumidify the air, and therefore, will not cool your home uniformly, which can cause severe damages to your system that will cost you financially. To avoid this, ensure that you purchase and install an appropriately sized unit that will adequately meet your needs. If you already have an improperly sized unit installed, then you will have to find one that fits perfectly. Although air conditioners are built to last over a decade, running it non-stop, such as leaving your unit when leaving the house because you don’t want to come back to a hot home, will kill it before its time. To avoid making this mistake, ensure that you have a programmable thermostat installed, which you can program to turn on your air conditioning unit some minutes before you come home. The practice of setting the temperature of an air conditioning unit lower than the desired temperature to cool the room faster is one mistake that almost every air conditioner user make. This practice is false, and your room does not actually get cool faster. 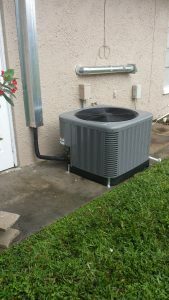 Instead, the AC unit has to work extra hard to achieve your desired temperature, costing you more money. It is best to always set your thermostat to your exact desired temperature. Replacing the air filters is the easiest AC repair task and one of the most neglected. Forgetting to change your AC air filters literally chokes it and can result in dire consequences, such as restricted airflow, reduced air quality, frozen evaporator coil, higher bills, and even cause permanent damage to the unit. To avoid this mistakes, always ensure that you change your filter at least once a month. Failing to carry out regular maintenance on your AC unit since the unit seems to be running fine, and you get to save some money, may cause you to miss minor faults that may lead to severe damages over time. Scheduling maintenance service for your AC unit should not be an activity you just do once in a while, or when your unit starts to develop faults. Always carry out regular maintenance services on your unit to lubricate, tighten or replace worn out parts on time before they become bigger problems that will cost you more money. Air conditioning units are pricey, so you should take care not to make mistakes that will damage your unit or cause you a lot in repair fees. We are the best air conditioning company in Cape Coral, and we are available 24/7 to help you get the most out of your air conditioning unit. Call us today at 297-2665 to schedule a consultation or professional maintenance and repair service. These are some of the main mistakes that people make with their air conditioner and now you can avoid them.